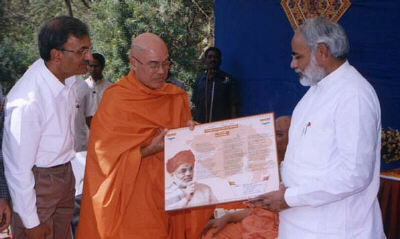 Gujarat Divya Jivan Sangh, Bharuch organized a Dhyan Yoga Shibir from Jan 5, 2004 to Jan13, 2004. The camp was organized under guidance of Sri Swami Adhyatmanandanji Maharaj for the benefit of Sivananda Hospital , Bharuch, managed by Divya Jivan Sangh, Bharuch. More than three hundred people attended the morning classes. Evening discourses on text “Bhaj Govindam” of Sri Adi Sankaracharya were also well attended and appreciated. The camp was inaugurated by Sri Swami Tadroopanandaji Maharaj, the president and founder of Manan Institute. On this occasion in his speech Swami Tadroopanandaji Maharaj said “Human birth, desire for liberation (Mumukshatvam) and company of saintly people (satsang) are rare gifts to have. 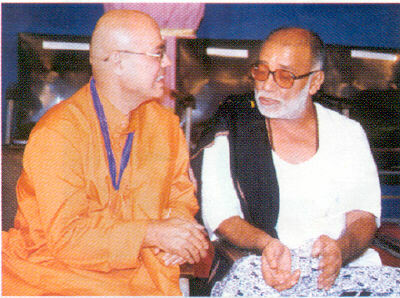 Swamij Adhyatmanandaji Maharaj is a great thinker and a personification of selfless service. Devotees are fortunate to have opportunity to listen to the enlightening discourses on text of “Moha Mudgara” for seven days by Swamiji. Prominent people of the town including the president of Municipality of Bharuch (Bharuch Nagar Palika), assembly member, Sri Rameshbhai Mistry and Sri Vasiaji (former minister of Gujarat state) were present in this Yoga Camp & Jnana Yajna. Rev. Swamiji Maharaj gave a lecture on “Self Management” organised by Narmada college of Management at Bharuch. Another lecture in Hindi on “Yoga for better Living” jointly organized by Bharuch District (Jhilla) Management Association and Gujarat Narmada Fertilizer Corporation also was well received by people. Rev. Swamiji Maharaj went for the last Darshan of 98 years old Mahant Sri Ramlakhandasji Maharaj of well-known Gumandev Hanuman Mandir at Bharuch. Swamiji Maharaj inaugurated Saraswati Sangeet Vidhyalaya Jhadeshwar and visited many devotee’s home during his visit to Bharuch. Members of Gujarat Divya Jivan Sangh, Bharuch were thankful to Pujya Swamiji for His visit to Bharuch and imparting spiritual knowledge and promoting spiritual activities. On Jan 14, 2004 on the occasion of festival of Makarsankranti, Pujya Sri Swami Adhyatmanandaji Maharaj, Srimat Swami Bhajananandaji Maharaj of Sivananda Ashram, Palghat, Kerala, Brahmachari Manas of Sivananda Ashram, Rishikesh and forty devotees from the Ashram including Sri Marutbhai Dave, Vice President of Divya Jivan Sanskrutik Sangh, joint secretary Smt. Poonam Thawani and Sri Murlidhar Thawaniji., joined Swamiji Maharaj for a short pilgrimage to Ambaji Temple in Khedbrahma District. On their way to Ambaji, the group came to Rojanta Kampa, farmland of Sri Pujakaka, where Cow worship was performed. Fifteen hundred cows were garlanded by Pujya Swamiji. The whole group had satsang and light refreshment on the farm before proceeding to Darshan of Holy Mother Ambaji. Rev. Swamiji Maharaj along with saints and devotee group also visited Sri Sarneshwar temple. It is 500 years old temple in dilapidated condition. They also had darshan of Sri Vireshwar Mahadev where Guptganga flows from under a tree. Pujya Swamiji conducted one more satsang on the way at Kadiyadara where about 500 village people participated. The group proceeded to Himatnagar, where Pujya Swamiji gave discourse on “Stress in daily life and Yoga” at Shri Nalinkant Gandhi memorial Town Hall, which was filled to the capacity. Yogasana demonstration was performed for the benefit of the audience. Visit to Bhuj & Adipur (Jan 16, 2004): During Swamiji’s visit to Bhuj, all India Radio Bhuj center recorded six talks of Swamiji on the subject of “Bhajgovindam”of Sri Adi Shankeracharya. The last stop of this trip was Adipur. Pujya Swamiji inaugurated the function of Dada Dukhayal Sangeet Sabha, Dada Dukhayal Remembrance Exhibition and his life work. Dada Dukhayal was a freedom fighter, a writer, a singer and had been beaten and imprisoned by police on many occasions during resettlement of displaced Sindhi community after partition of the country. At Adipur- Gandhidham, Pujya Swamiji sang bhajan in Sindhi, performed a puja and placed the pot containing ashes of Dada Dukhayal in the pit where his Samadhi (Statue) will be built. Swamiji also visited ailing Dr. Gajwaniji and prayed for his good health and speedy recovery. 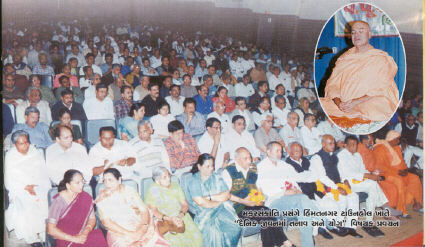 It was organized by the doctor group of Rakhial (east side of Ahmedabad). This area is inhabited by underprivileged. 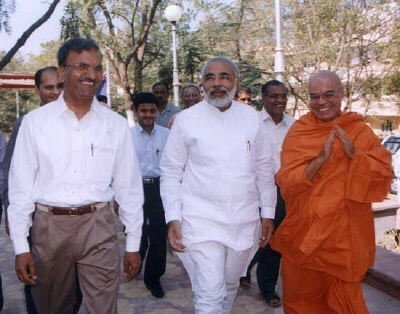 Former minister Shri Gordhanbhai Zarkiya and. Dr. Mayaben Kodnani, (present M.L.A) were also present during the camp. On Jan 26, National flag day Pujya Swamiji attended ceremony at Rakhial Camp, Sri Narayana Guru Vidhyalaya and Sivananda Ashram. Sivananda Ashram, Ahmedabad had distinct honor to host 1008 Mahamandleshwar Srimat Swami Satyamitranandaji Maharaj, founder of Shri Bharatmata Mandir, Haridwar. Spiritual discourses on the Subject of “Geeta Jivan Darshan” by His Holiness daily for five days were attended by a large numbers of devotees. Also devotees at large viewed through TV medium, as whole program was telecasted live by the local TV channel. Every day before the start of the discourse, well known singers provided Bhajan – Sangeet filled the atmosphere with divine vibrations. Among them were Smt. Nayanbhai Pancholi, Smt. Monikaben Shah, Shri Jayeshbhai Naik & Smt. Seema Trivedi, Smt. 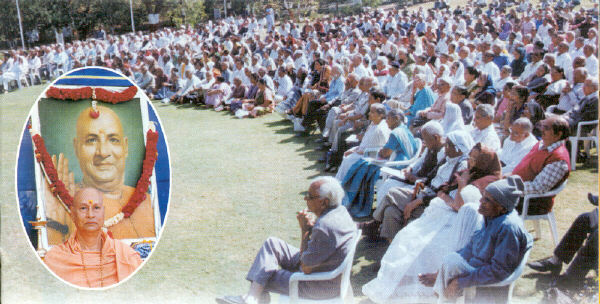 Harishidaben & Sri Janardanbhai Rawal, Smt. Mayurikaben Oza, Sri RashBihari Desai and group, Sri Krishanakantbhai Parikh along with Pandit Sri Nirajchandra Parikh. Also students of Sri Narayan guru Vidhyalaya sang the “Sahid Sainik Satak” written by H. H. Sri Swami Satyamitranandagiriji Maharaj. 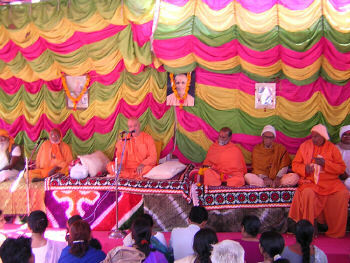 Sri Narayan guru cultural mission celebrated their annual day Jan 4, 2004 in holy presence of Rev. Sri Swami Adhyatmanandaji Maharaj. This month, satsang was arranged at Dr. Snehal Amin’s home on auspicious Vasant Panchami day in Holy presence of Pujya Swamiji Maharaj. And Puja of Sri Satya Narayan Vrata Katha was performed. At Annual prize distribution ceremony of Gujarat state edjucation group, Shri Morari bapu & Pujya Swamiji both were present. 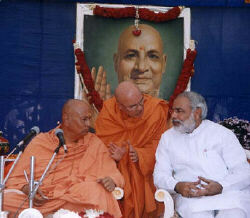 The meeting of the two great saints of Gujarat was a great moment for the devotees to observe. Alpha TV Gujarati channel shows “Yoga and Health” program of Rev. 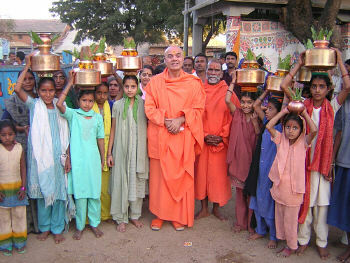 Swamiji’s three times a days and each episode is repeated for three days for the benefits of people. Also All India Radio, Ahmedabad aired three talks of Rev Swamiji on the subject of “Women Problems and Yoga”. In this month there were many devotees from UK , USA , Canada and Lithuania visited the ashram and stayed in the Ashram. Devotees come from all over at Sri Chidananda Dhyan Mandir for the Darshan and feel His Divine presence and inner peace .